When’s the last time you had the chance to immerse yourself, full-tilt in the land of the mystical? Fairies, dragons, archangel warriors and mythical libraries filled with details about every event and lifetime that’s ever happened. Throughout time, myths and legends have persisted because those with the power to connect with other dimensions have confirmed over and over that they exist. Beginning February 20, you have the chance to join 26 teachers, mystics and experts from around the world for Hay House’s free 7-day event…The Mystical Connections Summit. Caroline Myss, Brian Weiss, Sonia Choquette, and 23 others will share how to amplify the magic in your life, realize your destiny, turn your home into a sanctuary, create manifestation portals, connect with other dimensions… and so much more. 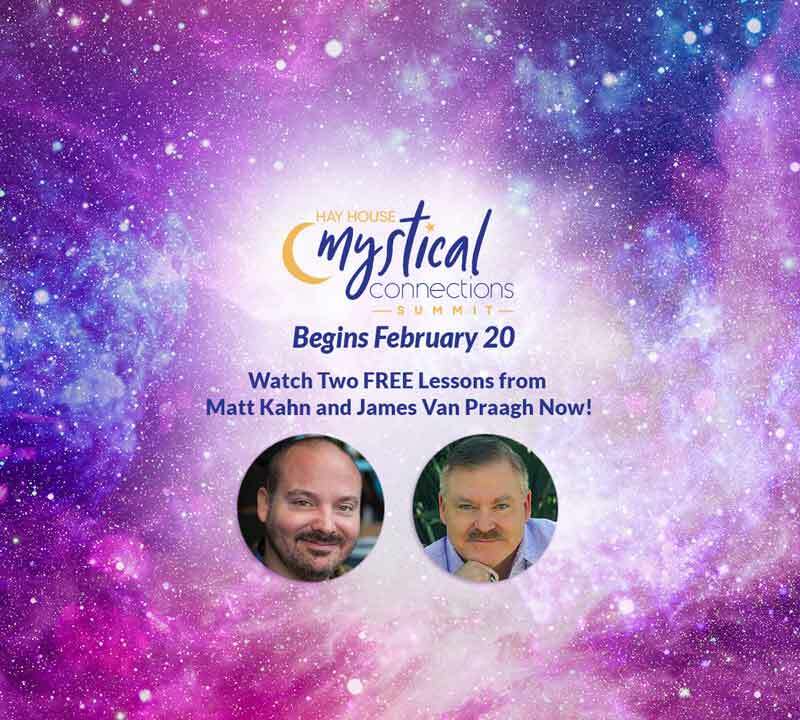 If you join now, you’ll have access to two exclusive video lessons from Matt Kahn and James Van Praagh. Worldwide spiritual teacher, Matt Kahn and Hay House CEO Reid Tracy discuss how to step into the best version of you, shrug off unworthiness and overcome what’s happening in the world. If you’re a lightworker who’s not manifesting things as fast as you want, who feels off, ungrounded, emotionally triggered, or like others aren’t recognizing the light you shine, this lesson is for you. It’s filled with spiritual healing and illumination that’s become the hallmark of Matt’s teachings. How to step into your light, worthiness, and power as a soul, no matter how far you feel from it now. Your surprising purpose on Earth – and how to live it. A simple process to distinguish your angels and guides from your own intuition. The underlying reason gratitude works, and why you need it. His true story of discovering his unique abilities as a psychic, medium and spiritual healer. Two healing mantras to help you discover worthiness and increase your communication with your angels. In this lovely introductory video from legendary medium James Van Praagh, he walks you through a straight-forward process to prime yourself for heightened awareness and intuition. He also discusses the different types of signs we encounter, where they usually come from, and how to understand and magnetize even more of them into your life. If you want to get in touch with your intuition, connect with loved ones on the other side, or feel more connected to the Universe, this lesson is perfect for you. The #1 way you can open up to receive signs and messages from the Universe. A warning for over-thinkers – plus how to get out of your head. How being “alignment” magnetizes miraculous coincidences into your life. Common ways deceased loved ones try to reach you, plus a powerful meditation to connect with them. The prayer he uses each day to draw positive messages and signs into his life.